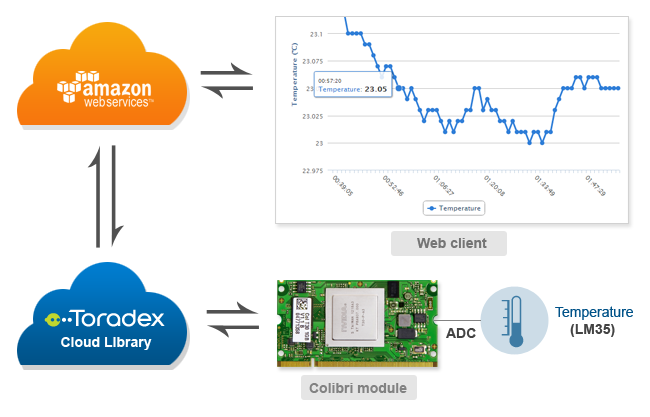 This demo shows how a Web enabled temperature logger application can be done using Toradex modules and Cloud library (Amazon RDS). On hardware front, temperature is measured using LM35 temperature sensor via ADC available on Colibri module and a C program running on WinCE sends the temperature data to MySQL (Cloud) periodically using our Cloud library. Web application is designed to show captured temperature data in the form of graphs and tables (Date wise). Such a setup can also be used in providing a central location for logging any kind of data from various devices across the globe, which can then be monitored or analyzed using desktop or web based applications. Amazon's RDS service simplifies the setup, maintenance and future scalability of database. Real world example can be Server room monitoring system. Temperature Sensor (LM35) connected over any analog input pin.